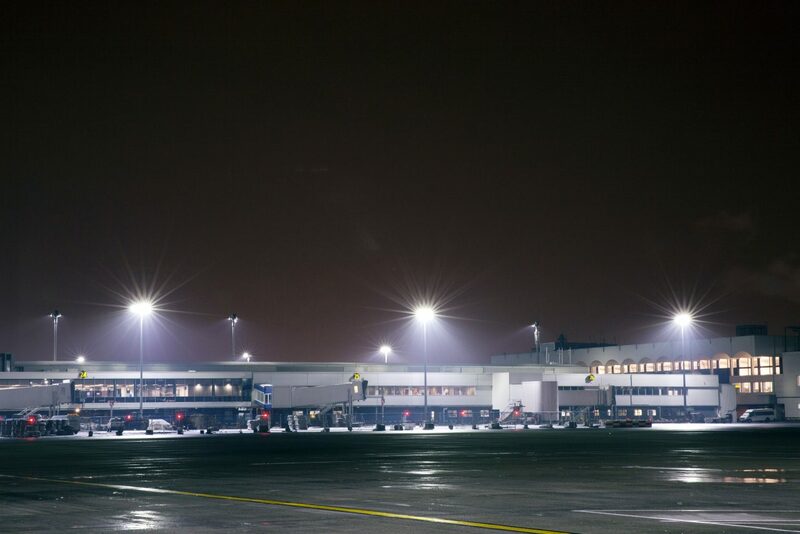 Midstream is a global leader in designing and supplying LED lighting for airport applications, which includes apron lighting, high-mast ramp illumination, illumination of cargo platforms, mobile tower lights, general aviation area lighting, car parks and large area lighting. 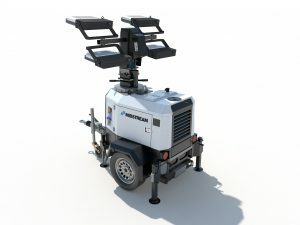 Midstream has been a pioneer of high quality LED projectors since 2010, and has built a reputation in the aviation market as the supplier of choice for major international hub airports as well as smaller regional airports around the world. 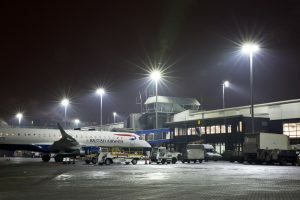 We work with airports in the UK, Ireland, Spain, Italy, France, Switzerland, Australia, India, as well as airports in Latin America, Caribbean, Africa and SE Asia. 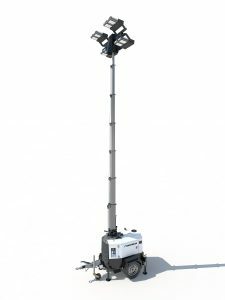 Our focus has been on LED technology for apron application, so we would not propose a street lamp or a sports projector for your platforms. When you need a reliable solution for mission-critical application, Midstream is the right partner. We are in a continuous process of research and development, leading the market with gains in efficiency, reliability, thermal management and power. 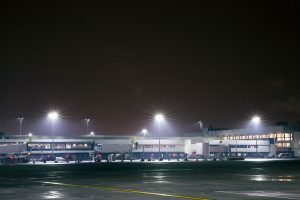 We work together with our partners such as Cree and Osram to be at the forefront of performance and a pioneer of high power LED lighting for airport applications – Midstream Lighting. We have developed a dedicated line to cater for high heat environments to provide reliability in hot climate conditions. We have full ownership of our IP, including our proprietary asymmetric optic lens system for low glare conditions, our thermal dissipation design and our component integration. We work with the best-in-class components, we use top-bin LED chips and we improve our product lines regularly to stay ahead of the market trends. 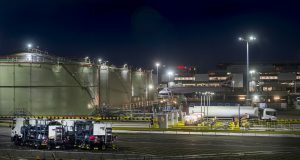 Midstream is your high-mast airport apron lighting partner that understands the constraints and challenges of working in a dynamic environment. 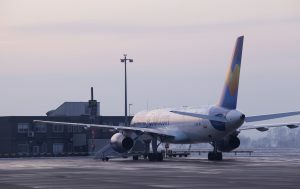 Our experience of working airside and landside of major international hubs (as well as regional airports) allows us to mitigate risks before they occur and to respond to challenges when they arise. When it comes to our customers in South America, we specialise in iluminación de platforma aviones and can provide technical materials in Spanish. 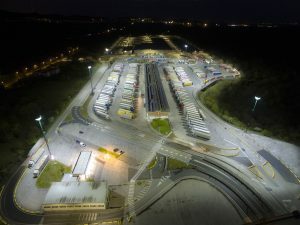 We have the full in-house capability to support you with additional lighting designs, as-built drawings, site surveys, investigations and reports. 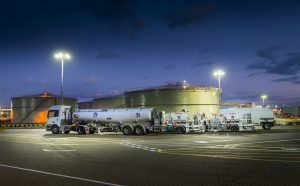 Our reaction time is very short and a dedicated account manager will be always fully briefed and on standby to respond. Midstream is the Winner of the prestigious “Inter Airport Innovations Award 2015”, presented by the CEO of Munich Airport for its Titan Series LED Floodlight. 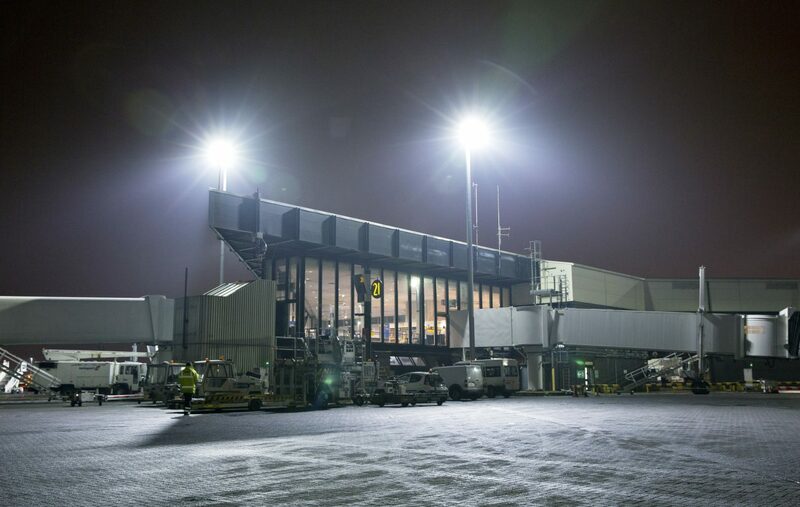 As an airport operator, you will need a lighting system that is well engineered, robust, dependable, reliable, fit-for-purpose and made to last. 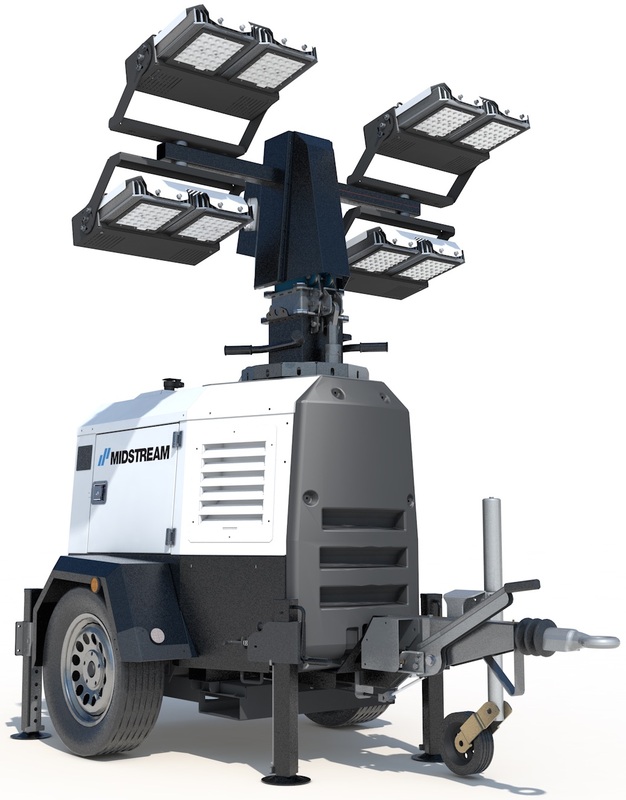 This is what Midstream offers and that is why so many airport operators choose Midstream as their apron-floodlighting partner. Floodlighting used to illuminate aircraft stands on the airfield (apron) has tradition been delivered by 1000W Sodium or Metal Halide projectors. 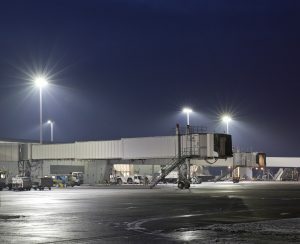 Midstream has been a market leading pioneer of LED based apron lighting which has been embraced by the airport community as a cost effective solution to deliver better lighting conditions, meet ICAO, EASA, FAA and CAP168 regulatory requirements for lux levels and reduce energy consumption and improve energy efficiency. Midstream LED floodlights are not the typical luminaire found in the market – it is specially designed to offer reduced glare, increased longevity, white light and high colour rendering. Unlike many others, we have developed our own products in-house, and this means we can continue to innovate and lead the field on the technology behind the product. 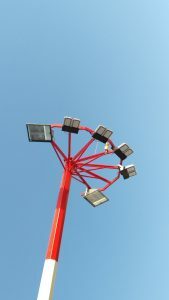 The luminaire is also designed to retrofit existing high mast infrastructure without modification, which includes raise and lower system, winch, hinge, and fix head crowns. Our products work with every major manufacturer of high mast poles and require little to no rewiring for a plug and play solution. To view our range of Exterior Floodlights click here. We are an award winning technology company that focuses on quality, innovation, usability and the life cycle user experience. We are trusted by some of the world’s busiest airports to deliver the best lighting system on time, on budget and on specification. You can find our LED luminaires in airports in Australasia, SE Asia, Europe, Latin America, and Africa in small and large airfields. 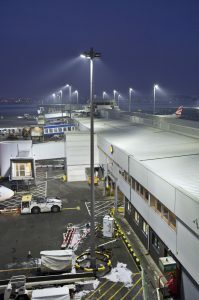 We have experience of airside projects in retrofit and new build, greenfield projects as well as land side car parking mast and large area lighting. We are a specialist manufacturer of LED floodlights, which means we do not do anything else. This makes us a specialist and this makes us unique. When you are designing your airport, nothing is left to chance. Specialist skills are drafted in for everything, from electronics to ATC but often lighting is overlooked. 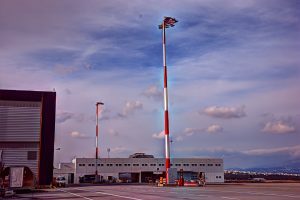 To optimise the location on your lighting columns, to generate the most cost effective solution for your terminal and airside design, turn to the real experts that understand the challenges and complexities of a busy, dynamic airport. Visit our Airport Sector webpage to see our offering. Midstream can work with you from your concept and masterplan stage all the way to detailed design and specification. 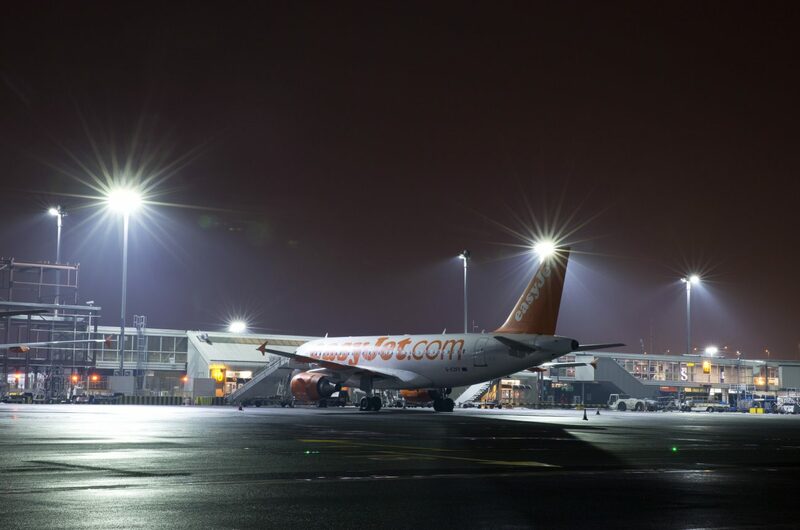 Therefore, if you are an airport operator, airport owner, design consultant, consulting engineers or electrical engineers, speak to us to receive the latest and most efficient layout for the airport apron lighting system. Contact us to make your enquiry. 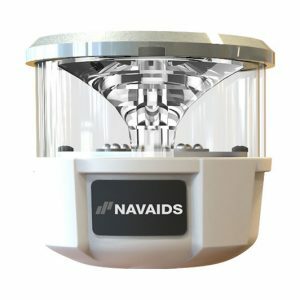 As a leader in the field of Aviation, Marine and Transportation Infrastructure lighting, Midstream has partnered with NAVAIDS to offer high-quality LED Obstruction Lights and LED Navigational Aids, including Solar-powered LED Portable Lights that can be used for Airfield Ground Lighting (AGL) or aviation obstacle warning lighting. Please contact us with your requirements to see which product configuration is suitable for your application. 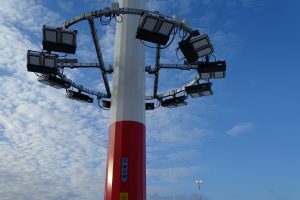 The Midstream Mobile Tower Light is a unique system that allows airside operators to commision an aircraft stand in full compliance with ICAO requirements. 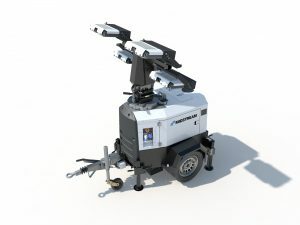 Proprietary high-asymmetry optics throw the light to the back of stand without tilting and emitting light into the sky. Low tilt operation significantly reduces glare to pilots and ground staff. 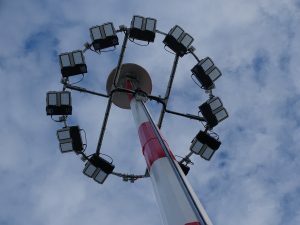 Featuring a 9 metre vertical, hydraulic mast, delivering an impressive average 20 Lux coverage over 3600m². Fitted with 4 x 326W LED asymmetric floodlights and a 110-litre long-run fuel tank, this system allows for commissioning of Code F and Code E aircraft stands in full compliance with ICAO requirements. Remote control, timer or photo-cell operation allows for autonomy even on remote aprons. Main application areas are low usage stands, remote aprons, stand reconfiguration and temporary or no-power network locations. Two masts used in tandem can commission up to a Code F stand to Annex 14 requirements. To view the full tower light data sheet click here.